I create a Nasal browser for viewing the Nasal state. It's sorta like the property browser, except in Canvas, and with weird controls since I'm not exactly good at Canvas. Tested on 2.10, based off of Hooray's tutorial on the wiki (Hooray: your work on documentation has been much appreciated!). Close button (or the escape key) closes the dialog, upon which point the code refreshes so that changes made will appear when it is next opened (rapid prototyping). Clicking on the title bar will go back in history, clicking on an entry will go inside of that entry -- either a vector or a hash as both can be viewed (other types being displayed inline). Clicking and dragging on the displayed text will scroll the window . To use, place this file in Nasal/nasal_browser.nas and (preferably) add an entry to the menubar (the name tag should be "Toggle Nasal Browser" or similar and the Nasal script should be «nasal_browser.toggle_window()»). 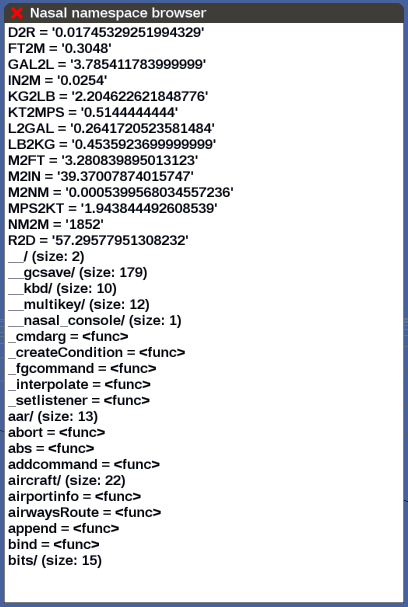 I pasted the Nasal code here: http://codepad.org/14koLKeg. Enjoy! well, what can I say: that's pretty freakin' cool and could be really useful for runtime-debugging, in fact it could be the foundation for lots of neat tools, not just debuggers !! Navigation-wise, I'd suggest to add a SVG arrow to the title bar - because you need to click on the non-titled part of the window to navigate back currently. EDIT: Actually, I'd just use a conventional .. entry at the top to navigate to the previous/parent-level - consistent with file system navigation, and the property browser. Okay, so I tried to convert this to use the new GUI (I'm hoping to add a "scrollable" widget – seeing if I can find my way around the code ), and I don't even get an Canvas on top of the window decoration. See this commit in my gitorious branch. Is there something I'm doing wrong here?? I should just be creating a Canvas like Tom’s GUI Demo and adding stuff onto it. Set the background color of the canvas to opaque white (255,255,255,1). The default blend mode of a Canvas inside a dialog multiplies everything drawn with the background color (like eg. with textures applied to objects). Thanks, that worked. Now I just need to find time to overhaul it for the new system... and implement a scroll bar... and all the other features on my wishlist. Doesn't Thomas already have some of the widgets, such as the scrollbar? I mean if not I'm sure he'd be happy to have some help developing the widget set! some of the original canvas demos did have scrollbar support, but those pre-dated most of the development that's been happening during the last 12 month, such as event listeners and canvas improvements. Yes, with the eventlistener system a scrolling area basically just requires to register an eventlistener on the mousewheel and change the transformation of the client area accordingly. Additionally eg. a simple line/rectangle indicates the position of the client area within the scrolling area. I really like the way Ubuntu does scrollbars with the Overlay Scrollbars and want to also implement this for FlightGear. I think I'll better do this scrollbars on my own, as it requires to draw outside the window/canvas and I'm not sure if everything required is already implemented (Though there should be a version which works completely inside a single canvas). A "classical" scrollbar is already possible to implement. Just draw a bar within an area indicating the postion and add two buttons on the ends (with click handlers) and you are done. What you said above sounds really good - I'd just suggest to keep in mind that being able to dynamically place/modify widgets would be awesome to lower the entry barrier for GUI development and allow others to help here, some sort of "layout/design" mode, where an arbitrary widget (canvas group) can be "authored", as in "resized/placed" or restyled. If that could be also supported at the property tree/canvas level via a handful of Nasal APIs, we would really open up the doors for fgdata developers to help with porting/redesigning the FlightGear GUI - if the widget APIs could be told to make a widget editable, people would need very little Nasal code to come up with WYSWYG gui/dialog or even widget editors. Sort of like having a handful of flags that directly allow groups to be affected all at once, I think we'd really only need some form of "Editable" interface class that is implemented by each widget, so that each widget can expose editable attributes (e.g. x,y,w,h, color/style) - and once the corresponding flags are set, those event listeners would be delegated to use the Editable interface implementation of each widget, rather than the actual callbacks that implement the widget functionality. For example, there could be a standard interface for rectangular widgets (think buttons, labels, sliders) for changing x/y, w/h - that would be shared by all rect widgets, and then some form of "label" interface for text labels (buttons etc). Philosopher wrote in Wed Jul 10, 2013 1:31 pm: Actually a good "development extension" would be one that shows the position in pixels when you click on a Canvas -- so I could just say "I want my text *here* [click]"
...now change the event-listener callback to directly modify a PropertyList tree in the property tree, and you'll end up with a WYSIWYG-GUI editor that allows you placing canvas-elements on-screen while serializing everything to a runtime tree/XML file. Thinking about it, a really useful feature would be allowing "meta modes" for groups that automatically affect placement/resizing, so that the bounding box for the corresponding group is rendered as a frame with hot spots (handles) for mouse drag/drop, so that the whole group becomes optionally resizable and draggable, without manually setting the corresponding properties directly - that would allow a simple widget/GUI designer to be provided on top of the canvas with very little work, just by accessing the top-level group - this could be all done through a single boolean property that transparently modifies the underlying properties and locks the thing afterwards. We could then even load our existing XML dialogs and drag/drop & resize widgets around, which would allow contributors to more easily update/port/edit dialogs and widgets. I think this could be easily provided at the canvas/GUI level through a single parent class in Nasal, without touching the C++ code - Tom ? I was intrigued enough to make an empirical test, and I've figured out my problem. I suspect it's a straight Mac <-> Ubuntu issue. - on Mac, the 'invisible' scroll bars appear inside the window. (As a translucent layer on top of the content). You mouse in the 'scrollbar area' to use the scrollbar. - on Ubuntu, the scrollbars appear when you move the mouse into the region inside the window, but you need to click on the floating part (which is outside the window) to interact with them. So as a Mac user, I see the feedback appear, and try to click/drag on the area just inside the window frame - and instead I get a regular click in the window, e.g. text selection - and the scrollbars disappear! Personally I prefer the Mac style - no need to draw outside the window frame - but switching between the two is really confusing. If I had no experience of the Mac approach I'd probably be fine with the Ubuntu ones.